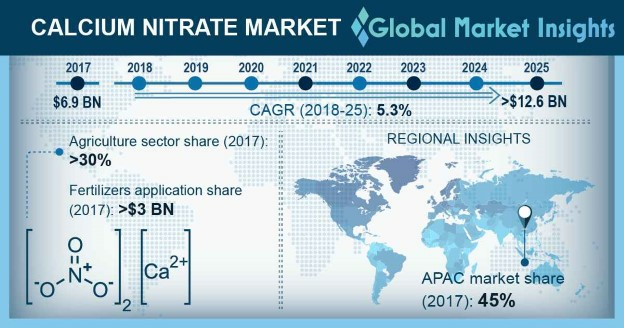 Calcium Nitrate Market size is forecast to exceed USD 12.6 billion by 2025; according to a new research report by Global Market Insights, Inc.
Water treatment chemicals are gaining prominence across the globe due to the increasing problem of wastewater disposal across the nations which have witnessed exponential growth in industrialization in past two decades. Calcium nitrate is used in wastewater treatment for preventing odor emission. Water is required to be treated to restrict suspended solid particles and prevent proliferation of bacteria, virus, and protozoa. Global demand for clean water has been increasing at a steady pace due to concerns associated with the environmental impact of biological contaminates and more stringent manufacturing requirements in process water.